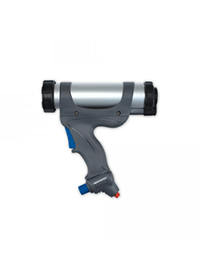 Light duty pneumatic cartridge applicator for 310 ml and 400 ml cartridges. Lightweight and ergonomically formed applicator which is perfectly balanced for comfort and ease of use. Inbuilt silencer (less than 70dB). Inbuilt air hose for safety. Glass reinforced nylon handle and anodized aluminium barrel for less weight but long life. For use with low – medium viscosity materials.Direct air drive. Compact applicators – ideal for tight spaces.